First two photographs, 2005, by iTravelUK: UK Travel Guide, which has generously shared them with the Victorian Web. Copyright of course remains with them. Readers may wish to visit their site for many beautiful images of the United Kingdom. Other photographs by Jacqueline Banerjee, and you may use these without prior permission for any scholarly or educational purpose, as long as you (1) credit the photographer and (2) link your document to this URL or cite the Victorian Web in a print one. Text by George Landow and Jacqueline Banerjee. 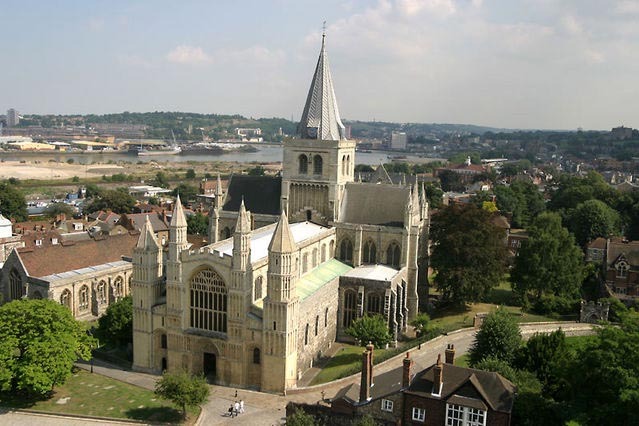 Rochester Cathedral. Restoration by Sir George Gilbert Scott (1811-1878). Beginning 1872. Left: The quire. 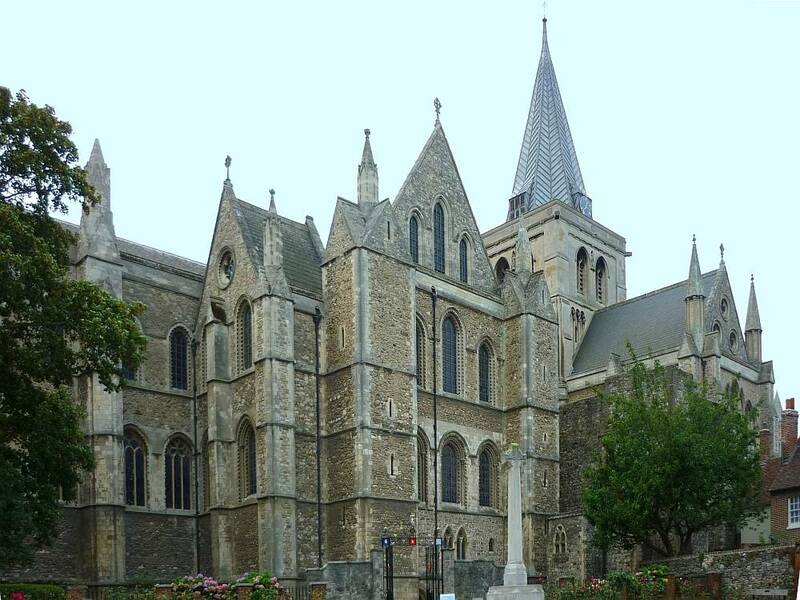 The Cathedral's own site describes it as "glorious Norman architecture." 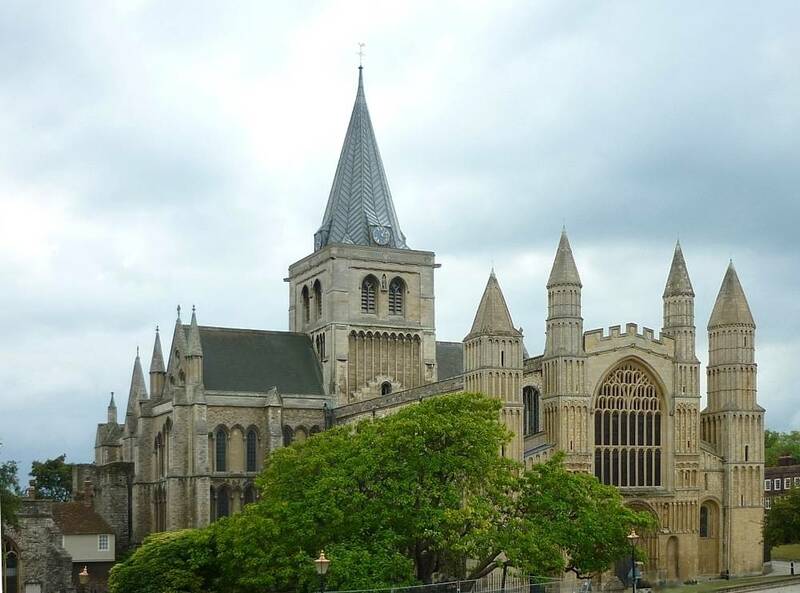 It blends the original design by Bishop Gundulf of Rochester, the Norman monk and talented architect who rebuilt the cathedral in the twelfth century, with later medieval rebuilding, wall decoration and furnishings, and Sir George Gilbert Scott's nineteenth-century restoration. This is seen as the geographical, historical and spiritual heart of the whole cathedral. Right: Closer view of the Cathedral's West Front. I had been called in once before on some minor matters, but was commissioned in 1871 to undertake the greater work. Externally the work consisted, in the first place, of the restoration of the north side and east end of the choir and presbytery. This part was terribly decayed, mutilated, and altered, but by careful study it has been brought back to its old state with a great amount of certainty. At the east end a perpendicular window had been inserted, and the lower range of lancets had been filled in with tracery of late date. These parts had been renewed some forty years back, and the question arose whether it would not be best, as the old design was evident, to bring it back to its original form. The great argument in favour of this step was the extreme ugliness of the great perpendicular window, which was very offensive to the Dean and others. This course was determined on, and carried out. A question then arose as to whether the roofs and gables, which had all been lowered, should be raised to their ancient pitch. There was not money enough to raise the roofs, but I persuaded the chapter to raise the gables, hoping that the roofs might follow, but as yet they have not. The design of the gabled roof, which formerly existed over the east side of the eastern transepts, was discovered by my son Gilbert, and has been restored to the north transept. There is a confusion of design in the windows of this transept, owing to my having left the jambs of some later windows which had been inserted there. The levels of the choir and presbytery have been regulated by clear evidence which remained beneath the modem floors. The tile paving is founded largely on portions of the old tiling then discovered, some of which have been preserved. The position of the high altar was ascertained and followed. The decoration of the walls behind the side stalls, and of the screen behind the returned stalls, followed exactly evidences clearly found, excepting that the shields of which we did not discover the bearings, have been filled with the arms of the Bishops of Rochester, worked out by the kind aid of the herald, Mr. S. T. Tucker, Rouge Croix. There was also another curious exception: at the back of the sub-dean's stall there was a patch of some older decoration of a very singular kind, a sort of plaid pattern. This the Dean would not permit to remain, but it has been taken out and preserved in a frame, I think in the chapter-room. The painting on the wooden screen had been covered over with renaissance decoration, but some parts had been left uncovered, and all was traceable. The screen itself is of the thirteenth century, and of oak. The original panelling is visible on its western side, that toward the east is of the fourteenth century. The stone screen in front is also of the fourteenth century, the two together supporting the rood-loft. The great transept on each side (south and north) has been restored externally. It had been most monstrously "transmogrified," yet parts of the old work remained, though in an advanced state of decay: in fact it had almost perished. The design has been recovered from these remains, aided by old prints. 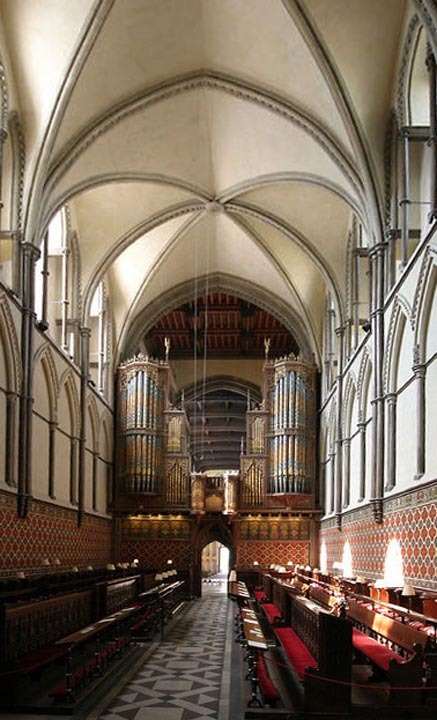 The interior of the south transept, with its timber groining, has been repaired, as has a projecting building on its eastern side. The clerestory and triforium of the nave, which were becoming seriously dangerous, have been strengthened. The north and south walls of the nave aisles are almost wholly of the date of some 150 years back. They, no doubt, had gone over so much that they were then rebuilt. Their foundation was of loose chalk and had given way. This is now banked up (underground) with concrete. Note Scott's condemnation of earlier "transmogrification" and efforts to recover original design wherever possible ("to bring it back to its original form"), as well as to strengthen the structure; also the usual financial constraint ("There was not money enough to raise the roofs, but I persuaded the chapter to raise the gables, hoping that the roofs might follow, but as yet they have not"). It is also touching to see the credit given "to my son Gilbert": that kind of encouragement and co-operation was what enabled architectural dynasties, like the Hardwicks and others, to flourish. Scott, Sir George Gilbert, R.A. Personal and Professional Recollections, edited by his son, G. Gilbert Scott, F.S.A. London: Sampson Low, Marston, Searle, & Rivington, 1879. Internet Archive. Web. 25 February 2012.